In this episode of the Beginner's Garden Podcast, you'll learn 5 organic ways to both prevent and get rid of cabbage worms in your garden. So I thought I would visit this topic again and answer some of those questions. In this episode of the Beginner's Garden Podcast and in the post below, I dive into nine of the most common questions I hear. Click below to listen to the full discussion or continue reading. Though I have been starting seeds indoors for several years, I wanted to ask an expert to weigh in on best practices. In this episode of the Beginner's Garden Podcast, I talked to Kevin Espiritu of Epic Gardening, and he shared with me what you need to start and grow your seeds inside. Sometimes we jump into choosing our crops and designing the layout of the garden way too fast. But if we take step backward and work through these three overlooked but crucial steps in garden planning, we'll find not only will the rest of the planning go more smoothly, but we'll end up with a more successful garden overall. Let's start our 2019 garden season off right! Whether you're looking for gift ideas or just hoping to expand your garden resources, here are my top eight favorite tools and books I've used in and for my garden. Even beginning gardeners understand how critical healthy soil is to the life of their plants. But how do you know what's going on underneath your mulch? Without a soil test, you're just guessing, and you might even attempt to fix problems without knowing the root cause. A soil test is a critical but overlooked component to understanding the home in which your plants live. In this episode, I'll go over the basics -- why you need to test your soil, when to test, how to test, and what to do after you receive your results. Click here for the full blog post with the information presented today. If you're on your second year of gardening or beyond, this action plan will help you get started on your garden planning so you can have your best season yet! BONUS LIVE TRAINING! Details at http://journeywithjill.net/headstart -- Don't miss it! This time of year many of us are gearing up for a big garden clean-up. We want to put our gardens to bed for the winter, preparing for a fresh, blank slate in the spring. But is a fall garden clean-up really best? Today I share why you might want to skip some of those clean-up tasks, what happened in my garden when I did, and how you can decide what should stay and what should go. Click here for full show notes and blog post. Gardeners are learners, and each year we are given the opportunity to learn new lessons. Here are five lessons I learned from my summer garden this year, where you'll learn the results of some neat experiments I got to perform in my garden this season. 60: Should You Grow Garlic? Garlic isn't one of the most-talked-about crops for beginners to grow. Why is that? There are so many reasons for beginners particularly to include garlic in their garden plans, and in this episode you'll hear three of them. BUT, growing garlic isn't for everyone, and there is one reason it might not be the best fit in your garden.This episode will help you decide if planting garlic this year is right for you. What is a Garden Zone and what purpose does it serve in the home garden? Unfortunately, garden zones are frequently misunderstood. In this episode you'll learn what a garden zone is, what it tells you, and more importantly, what it doesn't. For show notes, the US plant hardiness map, and links to find your average last and first frost, click here. Planting and growing a fall garden can be just as rewarding as a summer garden. You just need a bit of preparation. Here I share easy ideas and tips on how to get started, when to plant, and how to grow vegetables in the fall. Most of us, even if we have a small garden, will harvest more than we can consume fresh. Unless you want to give it all away, you will have to decide whether to let it go bad or preserve it. In this episode, Pioneering Today's Melissa K. Norris gives us the basics on how to get started in home canning. Get the show notes, resources and blog post here. We all learn our best lessons from the hits and misses from our own gardens. In this episode of the Beginner's Garden Podcast, I share 9 lessons I've learned in my spring 2018 garden -- including the successes and disappointments. Click here to read the show notes/blog post including resources mentioned in this episode. Integrated Pest Management (IPM) expert Patrick Byers of the University of Missouri Extension shares what the home gardener should do before you spray anything on an insect. Plus, he gives practical suggestions for how to manage aphids, squash bugs, squash vine borers, cabbage worms, slugs, and Japanese beetles -- all organically and with minimal spraying! View full blog post with show notes here. Register for the Modern Homesteading Summit here. Full show notes and blog post, along with resources mentioned in the podcast here. That's why, on this very special 50th episode of the Beginner's Garden Podcast, I share 15 tips that these gardeners shared with the group, along with my thoughts on each piece of advice. These 10 ideas will get you started on using succession and relay planting in your garden, and as you consider your growing season, crops, and climate, you can adapt using these principles to fit your unique garden situation. To get the most out of both your rest time and your harvest, though, there are some steps you can take to make it all run more smoothly. Even though I had all the trellis ideas and resources at my disposal, I still didn't figure it all out, and it took learning by experience and making mistakes to start to make progress in this area. In this podcast episode I'm talking to you -- the beginning gardener -- in hopes of helping you skip the mistakes I made. I discuss four types of tomato trellising methods. But beyond just listing the methods, I'm helping you decide which one (or ones) will work best for your garden and your needs. Because there's no one-size-fits all approach. It's one of the most confusing topics for beginning gardeners. "When should I plant?" I go over the basics -- what you need to know to help you plant the most common crops in the home garden at the right time. Not only do I give you general guidelines, but we also talk about something I have never heard anyone suggest when it comes to warm season crops. Container gardening isn't as easy as it seems. In this episode, Randy from FarmDaddy shares his top tips to growing in containers, including 3 big mistakes he sees people make, the ideal growing medium, how close plants should be together, and fertilization and watering tips. But as in any venture, there are mistakes to be made. The problem with mistakes with raised bed gardening is many times they aren't easily corrected. I know this from experience! From my own experience and from the experiences of others, I've compiled a list of 7 common mistakes in raised bed gardening. If you're planning a garden for the first time or adding to your existing beds, this will help you avoid many of the mistakes I and others have made. And if you're already gardening in raised beds but are seeing lackluster results, you may find some reasons why here. This year as I've begun my garden planning, I decided to make ten specific adjustments in my gardening. Whether I am making these adjustments due to learning more or by past failure, my hope is that some of these will help you make your garden more successful this season! Enrollment is open for the Beginner's Garden Shortcut. Details at http://journeywithjill.net/gardenshortcut. Get your free "Dirty Dozen Alternative" download plus today's show notes at http://journeywithjill.net/dirtydozen. It never fails. In early summer, just as we begin harvesting a few fresh squash and zucchini, some of the most common and menacing insects threaten our crops. In this episode of the Beginner's Garden Podcast, I talk about how I deal with the squash bug and squash vine borer. How can I get rid of aphids? It's one of the most common gardening questions I hear. But I think sometimes we jump to rash measures. Listen in on my thoughts of how to deal with aphids naturally and effectively. As gardeners, sometimes the best thing we can do is reflect on what worked and what didn't. In 2017, I enjoyed my best garlic harvest ever, but I did struggle with onions. Here's a recap of what I learned. My hope is you'll take a few tips to help your own garlic and onion harvest. It's always helpful to talk to veteran gardeners -- those who have had years of hands-on experience. But I also find rich advice in talking to brand new gardeners whose successes and failures speak new and fresh. If you're a beginning gardener, you'll enjoy hearing from Whitney Cromley. 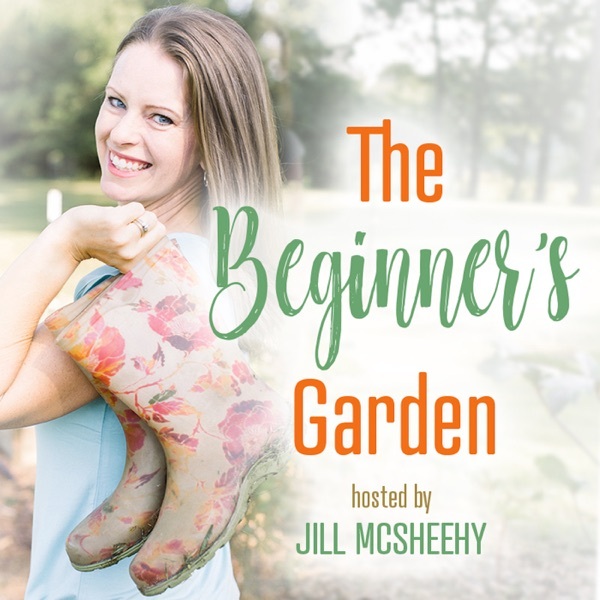 She shares her experience as a brand new gardener and what, as a true beginner, she has learned her first few seasons. Listen to her tips for beginning gardeners, large or small. It took me three seasons to finally attempt growing corn. I wish I could tell you it was easy and all went great. Unfortunately, it didn’t. But once I got past the challenges, it's now one of our most enjoyable crops. In this episode of the Beginner's Garden Podcast, I want to help you avoid the mistakes I made and harvest a bumper crop your first season. If there’s one plant I’d say I’ve had the most success with since I began gardening, it would be green beans. From the first season, I've grown enough to supply our family with green beans all year. Here are my top tips to never have to buy green beans from the grocery store again! The past few years I have found myself begging my friends to take my excess cucumbers. I’ve even been known to sneak a bag full on a table at church, hoping someone would take a few home. But growing cucumbers hasn’t always been this successful. My first year I met several challenges. From both my success and failures, my hope is that I can give you the basics you need to grow a successful harvest of cucumbers. The most popular vegetable to grow, tomatoes find a spot in most home gardens. Whether we grow them for canning (like I do) or for fresh eating, a bumper crop of tomatoes can make any gardener feel like a pro. So how do we get that bumper crop? Whether you want to grow snap peas, shelling peas, or snow peas, this episode will walk you through the basics -- from choosing which kind to grow to planting to harvest. When I began gardening, I had no idea what tools I would need. Because my purpose for gardening in the first place was to save money, I had no interest in blowing cash on unneeded equipment. But as I soon realized, some tools make a huge difference. In this episode of The Beginner’s Garden Podcast, I share my five favorite garden tools with you. Along with the joys of a long growing season, southern gardeners also face a unique challenge -- cool weather crops don't thrive in the summer. So how do we plant lettuce, broccoli, and spinach? In this episode of the Beginner's Garden Podcast, I give tips that any gardener in a long, warm-season climate can use. 10: Yes! Even a Beginner Can Grow Potatoes! Potatoes are one of my most enjoyable crops to grow! They require little maintenance, and they harvest before the hot weather in my area begins to set in. Harvesting, though labor-intensive, is so much fun — and my kids enjoy it, too! If you're looking to grow potatoes in your garden, these tips will help you grow a successful crop. I had no idea what I was doing when I planted my first four blueberry bushes in the ground. Thankfully, the research I did served me well, and now I have more blueberries than I know what to do with! If you long for sweet blueberries from your own back yard, today’s episode of the Beginner's Garden Podcast will give you what you need to get started! In the podcast, I discuss your best bets for beans, peas, cucumbers, and tomatoes. And because I list lots of ideas in the podcast, this week’s show notes are chock-full of ideas to get you started. In this week’s episode of the Beginner’s Garden Podcast, I break down the plants that I prefer to plant as transplants, which one I plant as seeds directly in the garden, and which ones I start indoors. I explain why each plant responds better in my garden that way. I have used all 4 types. One is my favorite, but I also talk about why some experts say you shouldn’t use it at all.